Eryngium alpinum 'Superbum' is an elegant species for the herbaceous border, with metallic stems and large amethyst-blue flowers that mature to an intense steel blue/purple, it is one of the showiest of all the Sea Hollies. Perfect for exciting displays in the garden and for cutting. I love the drama of big spiky plants. 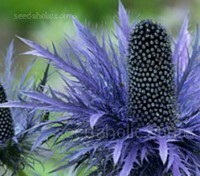 The most elaborately formed flowers belong to Eryngium giganteum 'Miss Willmott’s Ghost'. As the summer moves to its later stages, the whole plant reaches its peak in a blaze of silver. The plant will reward you with a glamorous late-summer display. 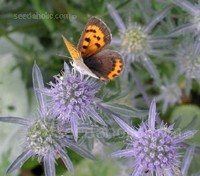 Eryngium maritimum is an evergreen perennial plant native to Europe. Often found on sea shores, it is a protected species in many parts of the world. Highly ornamental, it is grown in gardens for its metallic bluish flowers and intensely whitish-glaucous leaves, it is very attractive to bees and butterflies. 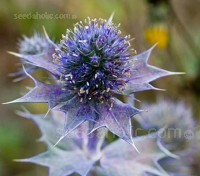 This attractive sea holly forms clumps of evergreen, soft, deep green heart-shaped leaves. In early summer, the thin wirey stems emerge, set with spiny leaves. 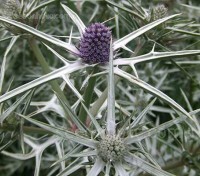 The branched stems carry a profusion of small, sea holly flowers in bright, steely blue. It prefers full sun and well-drained soil. 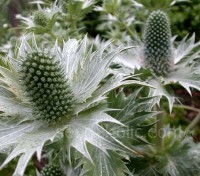 Eryngium variifolium ‘Miss Marble’ is a spectacular evergreen perennial. The neat mound of basal leaves are attractively marbled with silver veining. 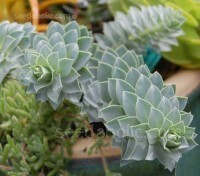 In summer upright stems bear silvery-blue flowers, each thimble is surrounded by long, slender bracts which splay outwards, adding to the prickly appearance. 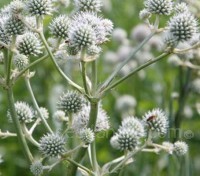 Long sword-shaped leaves that launch an architectural wonder of tight set thistle-style, white spheres, the flowers of Eryngium yuccifolium are borne on tall branching stems. The unique structure and colour make it highly desirable to gardeners as accent plants in borders and wildflower meadows. 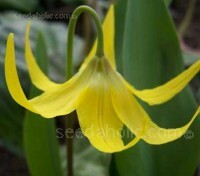 Erythronium dens-canis is attractive from the moment it pokes up from the soil in early spring. The oval pointed leaves with bronze patterns appear in early spring and are followed shortly by nodding rose pink to purple, elfin-cap flowers that bloom for several weeks. 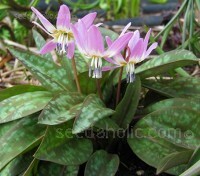 Erythronium grandiflorum is a rarely offered species. Native to west North America, it is one of the largest of the genus. Blooming in early spring, each flower stem has up to ten golden yellow, nodding, star-shaped flowers with reflexed petals. Summer Icicle adds wonderful contrast to bright summer bedding and container displays and is at home in the border where it performs well in hot and dry soils. 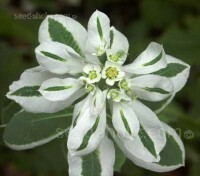 The flowers form small white cups at the top and centre of the plant. 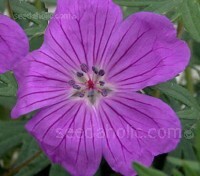 It is top branching so ideal for use as a cut flower. 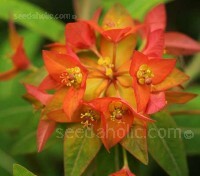 Euphorbia oblongata is one of the very loveliest euphorbias. 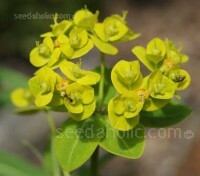 With dazzling yellow flowers, vibrant lime green bracts and dark green, oval leaves with pale green veins. Often grown as an annual, this fabulous and attractive plant is one of the longest-flowering and most valuable of commercial cut flowers. 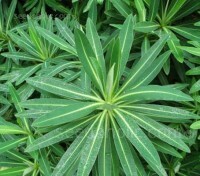 Collected from Eastern Nepal by Tony Schilling, Euphorbia schillingii, is prized for its unique chartreuse flower heads, textural foliage, and garden structure. 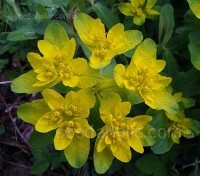 The golden-yellow bracts look like stars from a distance and bring a little zing to the garden. 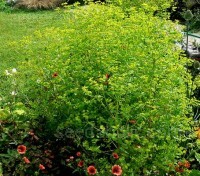 Imagine a red stemmed Gypsophilia with golden chartreuse flowers. 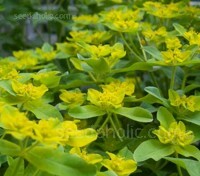 ‘Golden Foam’ is a rare compact Euphorbia that looks produces dazzling yellow flowers on massed wiry red stems. Rarely seen in gardens, this outstanding new introduction has an exciting future both as a garden plant and cut flower. 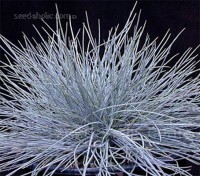 Diminutive Festuca glauca makes a tight mound of steely blue, needle-like blades and is one of the most tactile of the evergreen grasses. Planted as a specimen or in swathes across a garden, the colour is so unexpected it can't help but catch the eye. 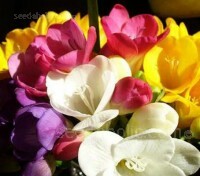 Loved for their delicate multi-coloured flowers and light, sweet, floral scent, few flowers can beat with Freesias for fragrance.‘Royal Champion’ produces plants with long, strong stems and large fragrant flowers. 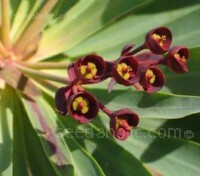 With up to eight blooms on each stalk, the funnel-shaped flowers float above a fan of sword-like leaves. "Splish Splash" is a fascinating, rare and prized border plant and one of the most beautiful, striking and unusual perennial geraniums. 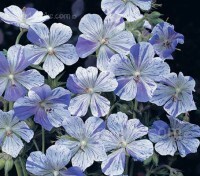 Very easy to grow, the clumps of divided foliage are topped with mauve-blue splashes and flecks on pure white petals, each petal appearing to be individually designed and painted. 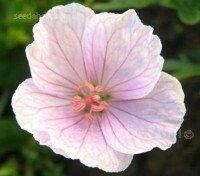 ‘Vision Light Pink’ produces masses of large luminescent light pink flowers with red veins from early spring through to late summer. This long-lived, drought-tolerant perennial is useful as a small scale groundcover and in mixed borders. 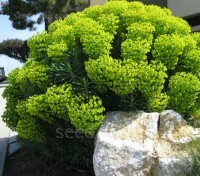 Use it in rock gardens, stone walls or even in container plantings. A beautiful, robust ground cover variety of the every popular Geranium sanguineum; ‘Vision Violet’ produces masses of large luminescent violet flowers from early spring to summer. The blooms cover this compact, mounding plant with intricately cut leaves. 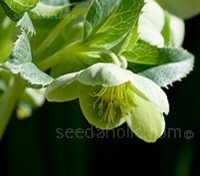 With bowl shaped, nodding flowers the colour of 'Granny Smith' apples, the Corsican Hellebore is an unmistakable plant. Its stout stems, deep green, leathery leaves and large heads of flowers mark it apart from all other hellebores. Easy to grow in sun or shade.